Founded in 2011, Lethal Talent, LLC is committed to providing diverse top level artists to bass music fans on a global scale. We provide professional and honest representation based on decades of experience in the music industry. 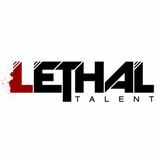 Lethal Talent is dedicated to establishing long term careers for hard working talent and represent a diverse spectrum of amazing DJs/Live Acts and ground breaking producers. Rooted in the ever-changing and growing electronic music world, Lethal Talent is committed to connecting cutting edge artists with audiences worldwide.